Those are all old Citadel Orcs, right back from the Fantasy Tribes range from the early 80s. Absolute crackers. I've got maybe 200 of them, though quite a lot need repairs as the weapons are quite fragile. 2 - lack of musicians and standard bearers - these really are minis designed for D&D, not for Warhammer! 3 - goblins - there were four or five styles of goblins in this era, which should I use? Any thoughts anyone has are welcome. I won't even think about starting anything till Christmas anyway. I don't care what you do with them but you better do something with them. Those old orcs are awesome! I never appreciated how cool they were until I got a hold of some of my own. I of course encourage using them for a 3rd edition army. There's no reason you have to stick strictly to the 3rd edition Warhammer Armies book, the beauty of the old editions is their purposeful open ended format. As far as the lack of musicians and standards, I know what you mean. I think the only slotta base Orc musician and standard I've seen are the ones that came with the Harboth and the Black Mountain Boys regiment of renown. But your Orcs with broken weapons might be usefully converted into standards and musicians. I have most of those in the first pic. Had em since the early 80s. They hardly ever get onto the table now. They're great. Thanks for the link! It's nice to see that they paint up well - older minis can be a little hard to get the best out of, I find. I do actually have a small regiment of the old Harboth's, as it happens. It seems there's some enthusiasm for this project. Mind you, if I posted some of my other possible Old Minis projects, you'd be enthusiastic about those, too! Maybe I'll sort myself out one regiment to paint up, and see how I get on with them? I have some older goblins that I once base coated, and this is inspiring me to dig them out and get them painted. Course fi I could just get my 6 mounted crossbow dudes done first. I have other crossbowmen that need finishing too, but ... it's the 6 mounted crossbowmen that I need to finish. I should possibly also admit that I am strongly considering painting these not-green... consider yourselves warned! I am surprisingly open minded about the color of "greenskins"; browns, oranges, purples or whatever are all fair game imo. Goblinoids is probably the better term over greenskins. If I recall, during my early rpg days Orcs were red, goblins were green, and kobolds were black. Woohoo! Excited to see this project. Looking forward to this as well. 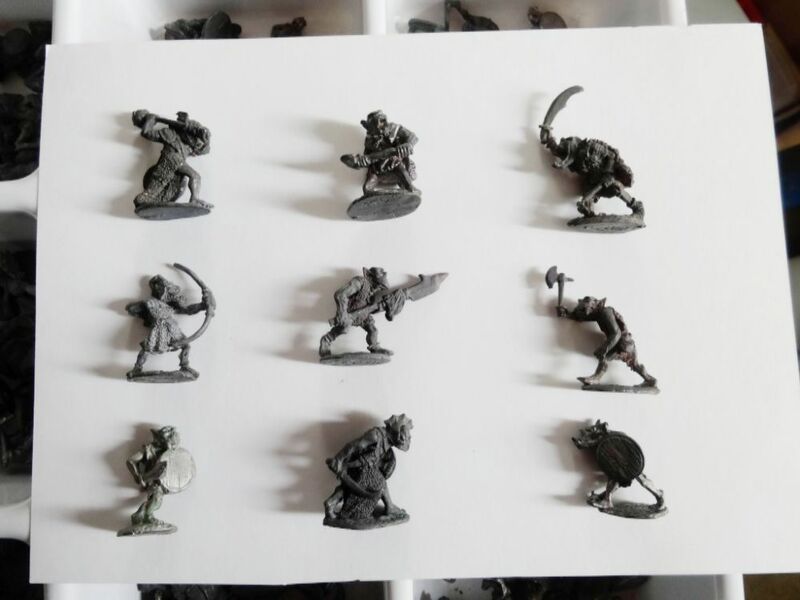 I agree with orcboy's comment above, in terms of adapting/converting other minis to standards and musicians. Even with "newer" old minis, like the Jes Goodwin/3rd. ed. Skaven, I ended up doing a lot of that. Fudge it. Adapt it. You don't need all the bells and whistles... or, if you really want them, convert or find some appropriate equivalents! 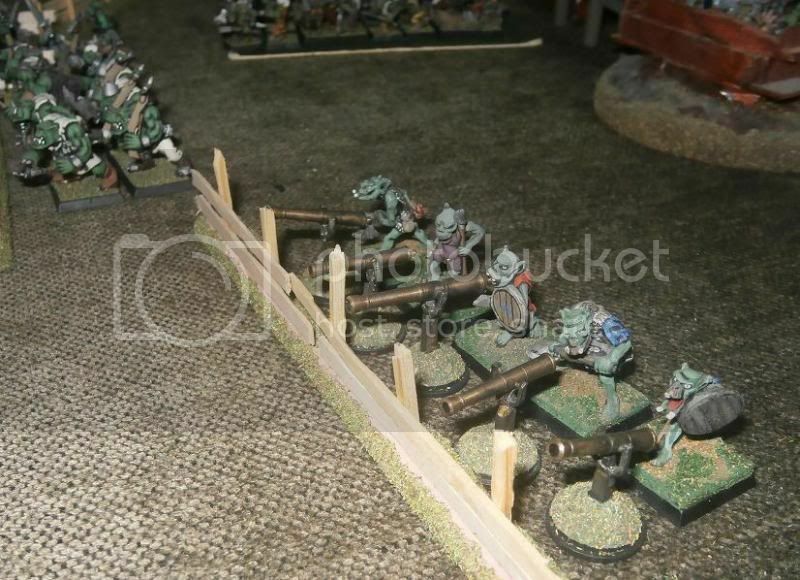 The original Citadel Colour paints included Orc Brown and Hobgoblin Orange alongside Goblin Green and Ghoul Grey. I think Kev Adams may even have invented green goblinoids (outside of The Green Goblin, I guess!)? The original Monster Manual has orcs as "brown or brownish green" with a "bluish sheen" and "pinkish snouts and ears" - these re your pig-faced style orcs, though. Why GW broke ranks with the AD&D orc picture I don't know. Meanwhile Goblins are yellow / orange / brick red in colour, and hobgoblins reddish brown with orange-red faces. So there! Ah, nice. He'd go well with my conversion of their Unithorn. Padre, how did you get those swivel guns? I have a particular purpose in mind for which such pieces would suit nicely. I got them from a model shop - the kind that does model railways and remote control cars and (most importantly) model ships - including the ones you make from scratch with balsa etc. 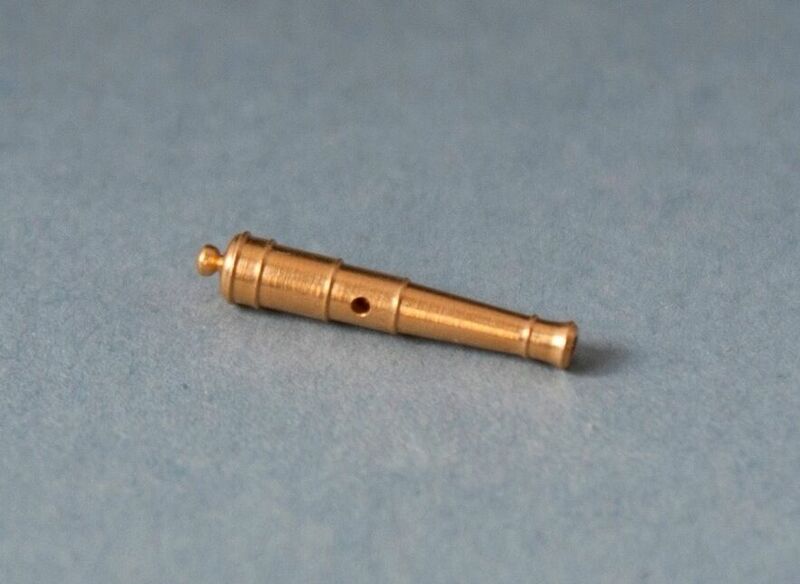 They're little brass barrels, which come in various sizes (different scales &/or different sized guns). I built the stands and mounts from bits of wood & sprue & pins and what not. Citadel Goblins 1979-1983. It's actually a bit of a mess, with models of different styles being introduced all over, and old models being kept in production alongside them. Even the early C series range is a mess. It's not until 1984, or arguably even the mid 80s and slotta bases, that Citadel actually get all their models ranges into order. Goblins are as good / bad example of this mess as any. I think these are the earliest. I always think of these as "Eastern" goblins because of their little hats, and because the broken spears once had long naginata-like blades . 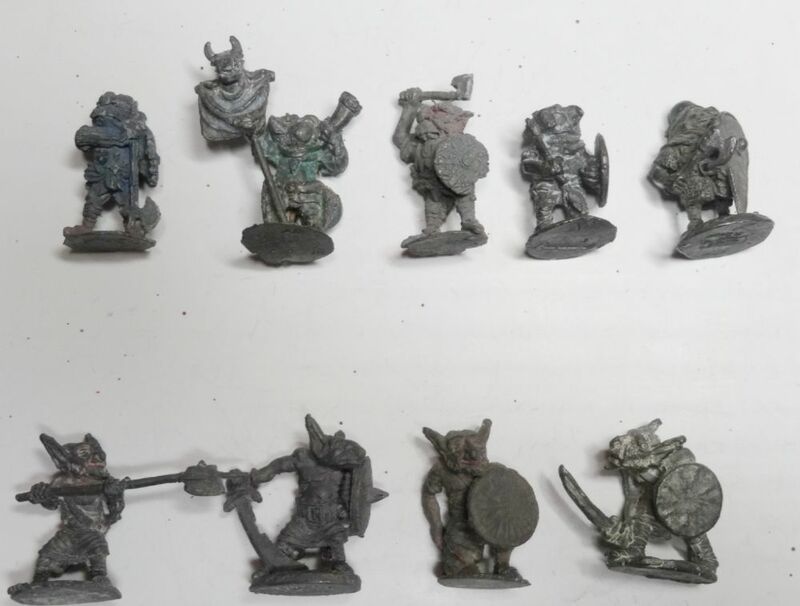 They are very dapper, orderly looking chaps, as Warhammer goblins go - but these are pre-Warhammer, D&D goblins. I think if they were human sized they'd make great AD&D Hobgobs. The wolf shield motif is nice. Yes kids, these were gnolls until 1982. Nope, I dunno. Absolute naming chaos. 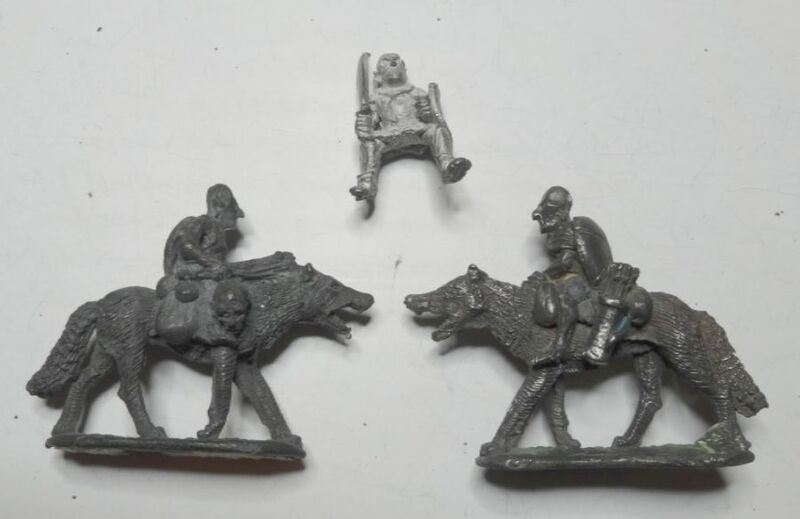 Looking very little like anything else in the goblin ranges, these were the only Wolf riders you could buy until about 1987 I think! (Gnolls / Great Goblins were all riding Boars at this time). There were some infantry figures in the same style, but don't trouble yourselves with those. These will look more familiar - everyone's favourite robe wearing Night Goblins appear. 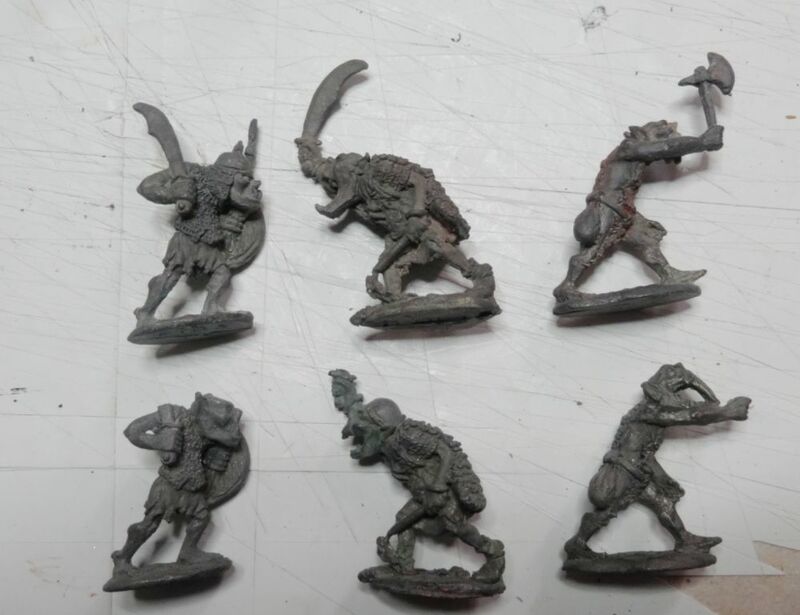 Of course, at this time, they were bundled in with the "Eastern" style goblins pictured earlier and also some guys who are much more akin to what we now think of as a GW Goblin. SO THERE YOU HAVE IT - the "what are the correct goblins to use with early Orcs" problem. Interesting! I recall seeing some of these as a youngster, and good to see them again. More hurdles! Replacement weapons. 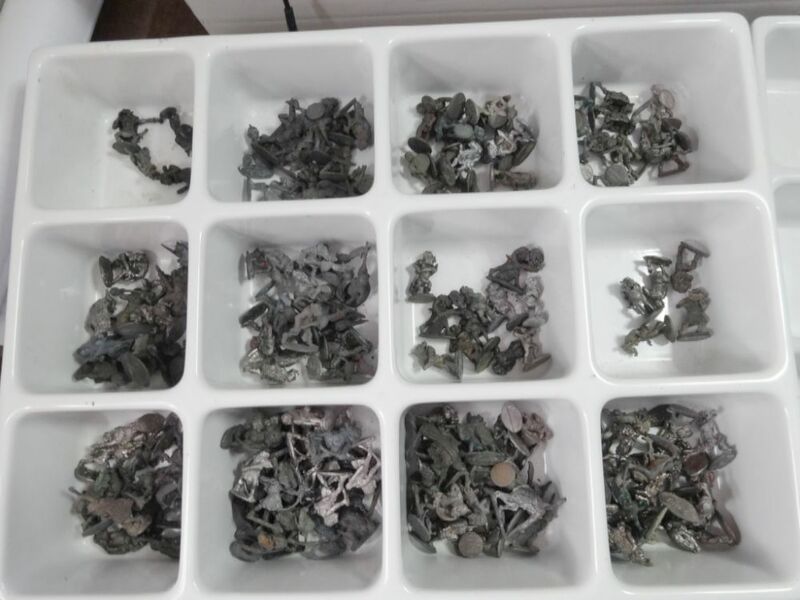 I'm going to need lots of weapons for repairing these orcs. One option is to make moulds from the originals and copy them. Let's call this the hard option! An easier option would be to source new parts. If anyone has any suggestions for weapons, especially scimitars like these, in metal or plastic or even resin, that'd be useful.